There is no better place to shop unique, crafted and curated gifts than Etsy. This online marketplace is the hub of handmade, individually designed and one-of-a-kind works of art. When you combine home decor then throw in the creativity of North Carolina creatives, you’re in for quite the treat. So whether you’re looking for a gift for yourself, your home, or a friend, shop local for your home decor from one or more of these amazing Etsy entrepreneurs. Happy shopping! Specializing in vintage, farmhouse and shabby chic decor, Ally Mignaud creates wall hangings and pieces of art that would find a place amongst any design style. Products in her Etsy shop include painted signs, mounted bottle openers, pallet art and, our favorite, state map wall hangings. Check out her beachy North Carolina piece here. Founded in 2017, Blue Mill Studio is the passion project of artist Jenna Thornburg. Through the shop, she exercises her passion for designing, creating, lettering and crafting. Now, you can shop beautiful, hand-painted doormats perfect for every doorstep. They’re available with clever and charming phrases, icons and even customizable options for your family. Based out of Wilmington, Carolina, Cottonwood is a husband and wife small business started in the spring of 2016. Showcasing their love for farmhouse design, the shop’s products include seasonal pillows, stylish covers, wall hangings, canvas banners and printable graphics so you can immediately spruce up your decor. Owner and creator Luna began Decoreum to continue her passion for great works of art. Previously, she restored works of art on canvas and now she does so on tapestries you can hang in your own home. Offering a fun and cozy spin on public domain pieces from artists like Van Gogh, Cezanne and Claude Monet, you can now have your own historic rendering! The ideal shop for every dog parent and design lover, Dog Crates and Kennels makes our pups a part of the decorating fun. The team behind this shop built their first crate for their own dog in their own kitchen. Afterward, they posted the design on Etsy and the rest is history. Today, you can shop kennels and even multi-dog kennels that can double as end tables or coffee tables. In short, your dog kennel can now be the most stylish piece of furniture in your home. To see more, check out the website here. Ansel Ringler kick-started his passion for woodworking as a child and now builds beautiful pieces of furniture and works of art from his workshop on the Estatoe River of Yancey County. Products available on Etsy include home furnishings like live edge tables, kitchen accessories like cutting boards, intricate wood wall hangings, and even custom-built furniture. 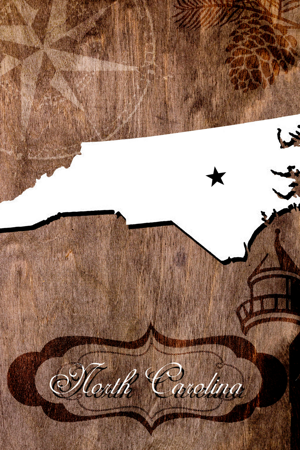 In 2011, the team at Home State Apparel created the original “home” shirt inspired by their love for North Carolina. They quickly expanded to include all 50 states and now their shirts are recognizable everywhere. Today, they still create everything by hand out of their shop in Greensboro, including the famous hats and shirts and gorgeous home goods that include map wall hangings, mugs and glasses. Mackenzie Bryant & Co. is a small online boutique out of Charlotte specializing in rare, vintage finds, custom pillow covers, and handmade fabrics. Their collection includes everything from throws and wall hangings to hand-knotted rugs and even skulls. You can shop on Etsy or check out the full collection on the website. Photo courtesy of Northern Oaks Decor Co. Originally started as a cathartic hobby, Northern Oaks Decor Co. has expanded into one of the most beautiful home decor shops on Etsy. Owner and creator Jenn Henry makes intricate wood art you won’t find anywhere else, as well as useful home goods like wooden bathtub trays, shelves and trays. Sow the Land is a project of creators and adventurers, Jason and Lorraine. In their shop, you’ll find wooden wall art that showcases their love of the mountains and the outdoors. We especially love the wall hangings they’ve turned into functional pieces like this Geometric Mountain Wall Hanging and Hat Rack! Phillip Fletcher and his brother Tully Mac Fletcher founded Durham Bookcases back in 1974. In 2015, Chase Fletcher brought their downtown storefront and warehouse to Etsy so furniture and decor shoppers like you can get these handmade pieces no matter where you live! Made to last, these bookcases, drawers, dressers and wine racks will last an entire lifetime. Built from Todd’s passion for building and his uncanny ability to build just about anything, this Etsy shop is run by a husband and wife team out of Winston-Salem. They work together on designs of elegant dining tables, industrial kitchen islands, rustic desks, and an entire line of handmade range hoods made from reclaimed metal and wood. The same W. Francis that has been seen in Pottery Barn and on HGTV can be seen right here on Etsy. Mad for technology, this North Carolina company designs every product digitally. Check out the full lineup of tapestries, pillows and table runners on Etsy here or check out the W. Francis website. Did you find something you love?